Any products containing retinol, alpha-hydroxy acids or beta-hydroxy acids, or benzoyl peroxide. Any exfoliating products or procedures that may be drying or irritating. *The use of these products/treatments prior to your peel may increase skin sensitivity and cause a stronger reaction. Patients who have had medical, cosmetic facial treatments or procedures (e.g. laser therapy, surgical procedures, cosmetic filler, microdermabrasion, etc.) 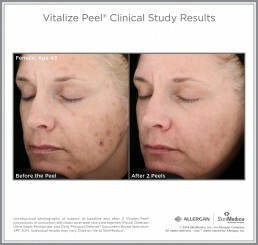 should wait until skin sensitivity completely resolves before having the Vitalize Peel® procedure. Patients who have had cosmetic injections should wait until full effect of their treatment is seen before receiving a Vitalize Peel®. Active cold sores, herpes simplex, or warts in the area to be treated. Wounded, sunburned, excessively sensitive skin. Accutane® use within the last year. Patients with a history of allergies (especially allergies to salicylates like aspirin), rashes, or other skin reactions, or those who may be sensitive to any of the components in the treatment. Women who are pregnant, planning to become pregnant or are breastfeeding. History of an autoimmune disease (such as rheumatoid arthritis, psoriasis, lupus, multiple sclerosis, etc.) or any condition that may weaken their immune system. Skin may be tight and more red than usual. Skin may feel tacky and have a yellow to orange tinge. This is temporary and will fade in a few hours. Wait until bedtime before washing the face. Avoid strenuous exercise on the day of the procedure. Skin may be tight up until it starts to peel. Peeling will generally start between 48-72 hours after the procedure and can last 2 to 5 days. Patients should adhere to the following regimen for optimal post-peel care. Cleanse: Use a gentle, soap-free cleanser like SkinMedica Sensitive Skin Cleanser® or Facial Cleanser. Do not scrub and/or use a wash cloth. Moisturize: While skin is peeling, patient should apply TNS Ceramide Treatment Cream™, Ultra Sheer Moisturizer, or other SkinMedica® moisturizer recommended by a medical professional as often as needed to relieve any dryness. Sun Protection: Apply Daily Physical Defense® Sunscreen Broad Spectrum SPF 30+ in the AM and throughout the day. Avoid direct sunlight for at least one week. The regular use of Retin-A®, alpha hydroxy acid (AHA) products or bleaching creams can be resumed after peeling process is completed. Receiving Vitalize Peel® for the first time. Severe sun damage (increased visible peeling should develop with subsequent peels). Having peels regularly with a short interval between peels. Frequent users of Retin-A®, alpha-hydroxy acids (AHA) or other peeling agents prior to the peel treatment. Regardless of the degree of peeling, the skin is still sloughing off at an accelerated rate which will result in the improvement of skin tone and texture, and diminishment of fine lines and pigmentation. For maximum results, the Vitalize Peel® can be applied every 4-6 weeks until desired results are achieved. Results are cumulative and maximum benefits are seen with a series of 3 or more peels. Extra precautions should be taken to avoid sun exposure following the peel. It is recommended that patients use a sunscreen product with an SPF of 30 or higher. 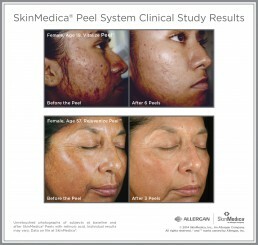 SkinMedica® recommends limiting sun exposure for at least one week after the peel is performed.